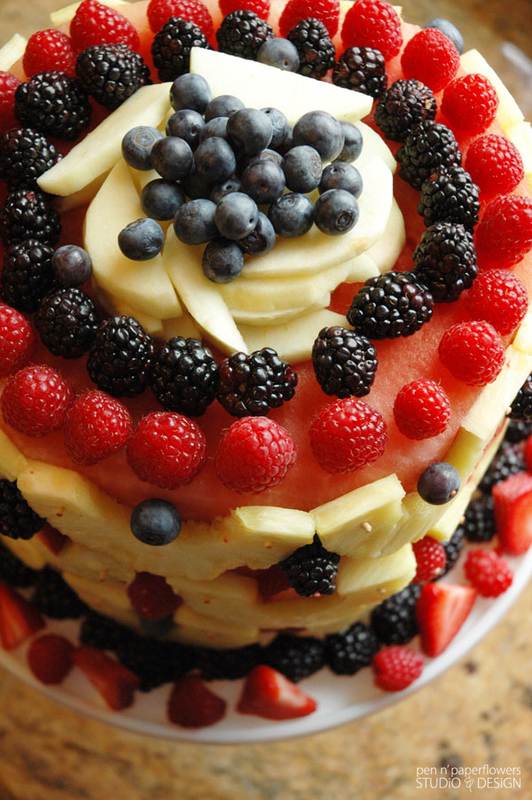 "Fruit Cake" typically warrants wrinkled noses and groans during the Christmas/Winter Holidays at it's very mention. Thankfully...this isn't the season for "fruit cake"! this cake is sure to turn heads while still tending carefully to the heart health of those we love. Click the "Read More" link below to get the rest of the details on the most delicious and nutritious fruit cake ever! 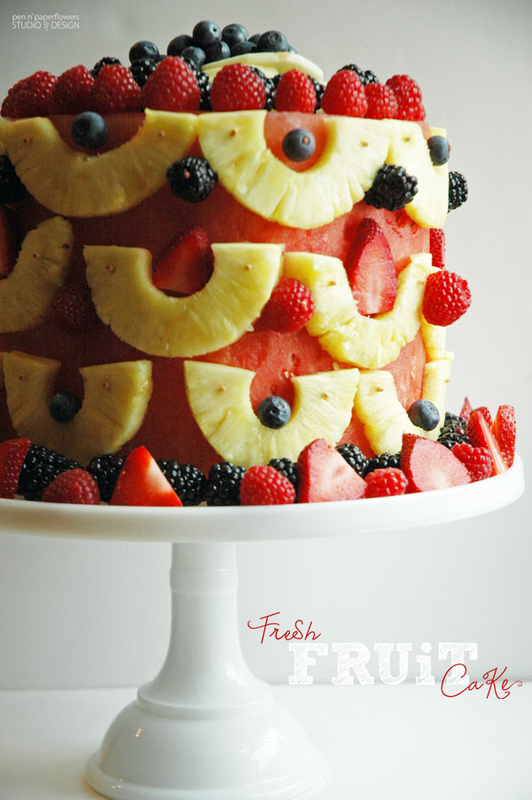 This cake first came to life when my daughter, Ema, requested "fruit salad" for her birthday dessert last year. my creativity kicked in and I was able to satisfy my daughter's original request as well as my desire to get creative in the kitchen. 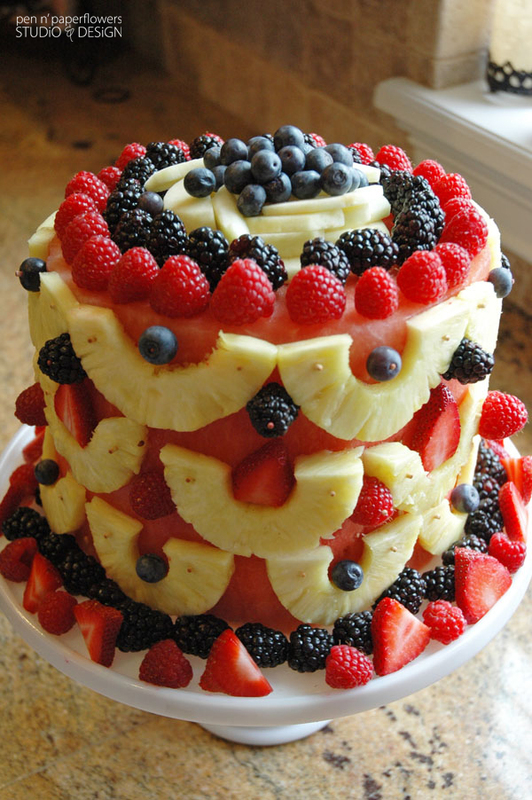 Hence...my version of a "Fruit Cake" was born. I decided to photograph the process for those of you who may want to create one of your own. the written instructions and an ingredients list are all the way at the bottom of the post. I hope you think it's as cool as my family thinks it is - specifically my now-14-year-old daughter who requested it again. which is why it makes it exactly the perfect cake for my sweet, not-so-typical-teenager, Emalyn Anne. 1 whole watermelon - this is the single most important item since it's the foundation of the entire cake. Base the size of the watermelon you choose on the amount of people who'll be attending the celebration/event - and how big of a cake you want to work with. This watermelon was a lot bigger than the one I used last year - I ended up turning it on its side so it wouldn't be too outrageously tall. Assorted selection of fresh fruit washed/rinsed - an assortment based on what's in season or what's available in addition to keeping in mind the favorites of the person you may be making the cake for. 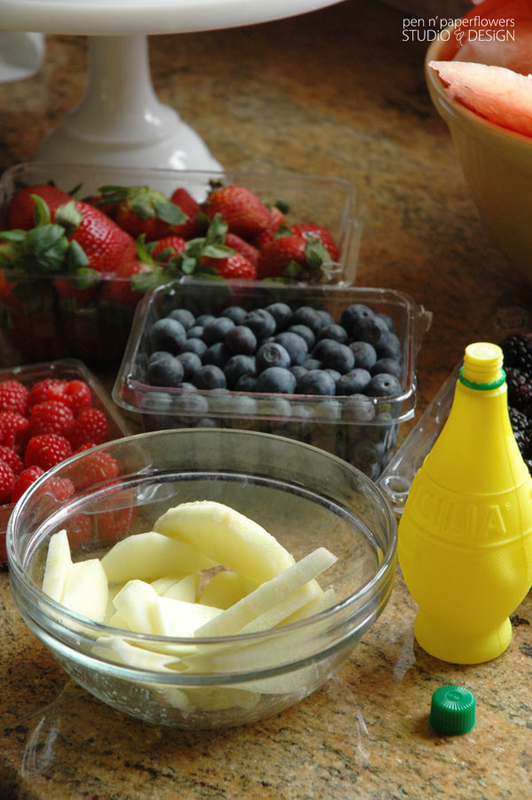 I used the following: strawberries, blueberries, blackberries, pineapple, raspberries and apples. Cake Stand preferably one with a slight edge like the one I used here. It's helpful with containing the watermelon juice when you actually slice and serve it. Gather your fruit and supplies together. 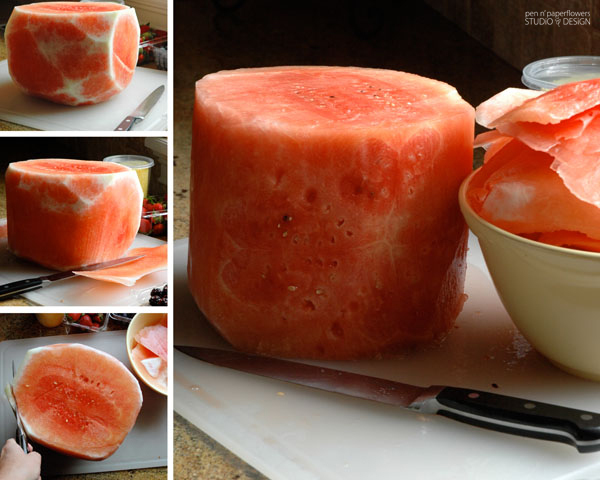 Cut the ends of your watermelon off and discard rind. CAUTION!! Be careful using your sharp knife - I don't need any injuries, people! 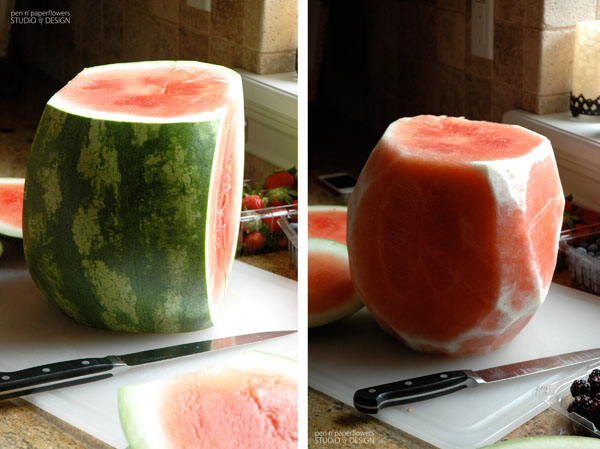 Turn the watermelon on its side so it's resting on one of the flat ends. Flip the cake/watermelon on its side if it's too tall - like I had to do. If the height works the way it is, then just leave it. 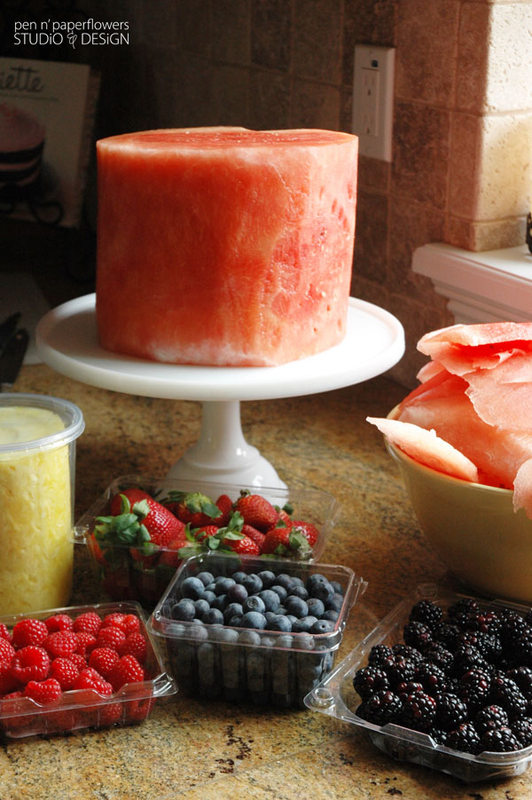 Shape the watermelon into a round cake-like base after the rind has been completely removed by shaving off the remaining white parts of the watermelon with your knife. 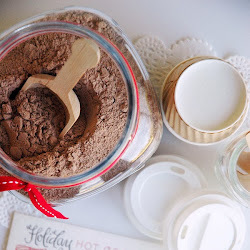 Continue SHAVING and trimming until you're satisfied with the shape - saving the edible parts in a large bowl for snacking. Add your fruit. There's no right or wrong. Get creative and come up with fun patterns. I started by cutting my pineapple in slices (not too thin) and then I cut my slices in half. 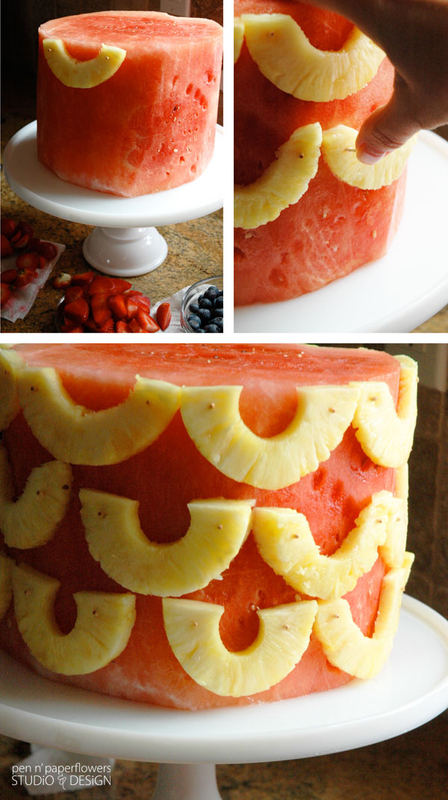 I then added all of my pineapple slices and filled in the spaces with the other fruit. 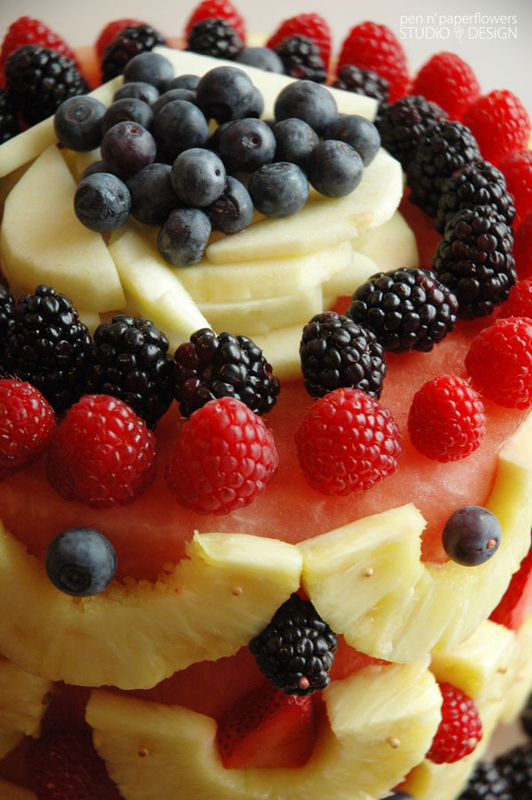 Top the watermelon with fruit. see images above I didn't use toothpicks for the top. 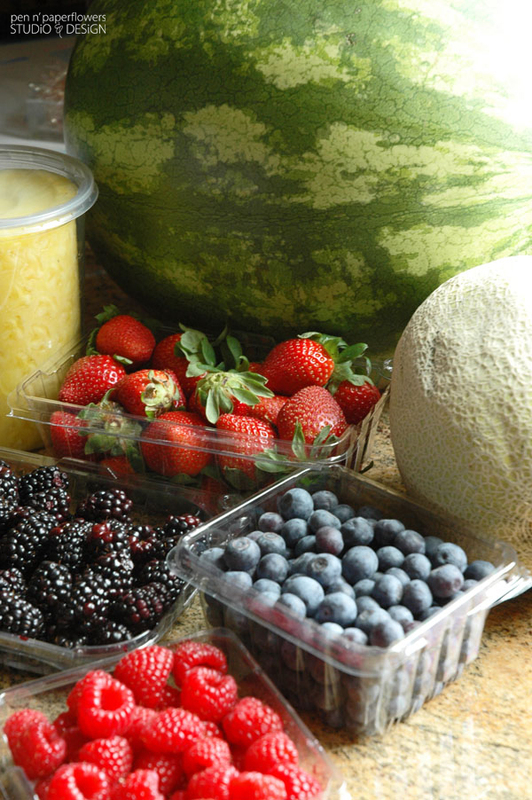 Finish by placing berries around the bottom the watermelon. Slice and serve the cake as you would a normal cake - in wedges. If yours is really tall like mine, you can cut the wedge in half after you've sliced it and serve two people with one slice. 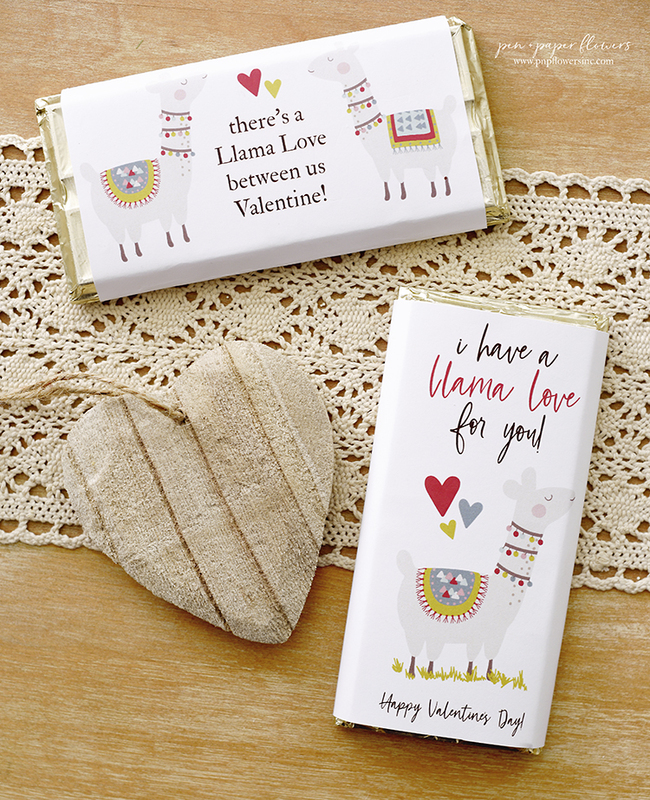 - Add birthday candles, sparklers or a cute cake topper! - There are no rules - get creative. 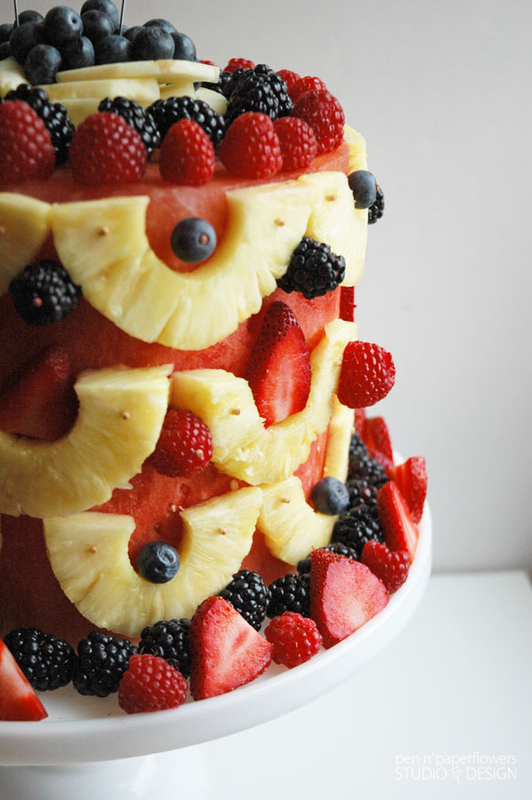 - Make sure the cake plate you'll be using is big enough for the watermelon base. - You don't need toothpicks for every piece of fruit - some of the berries were just nestled in the pineapple pieces. - The less toothpicks you use, the less you'll need to slice through/around and remove when slicing. - To keep your apples from browning, toss the slices with a tiny bit of lemon juice or pineapple juice. 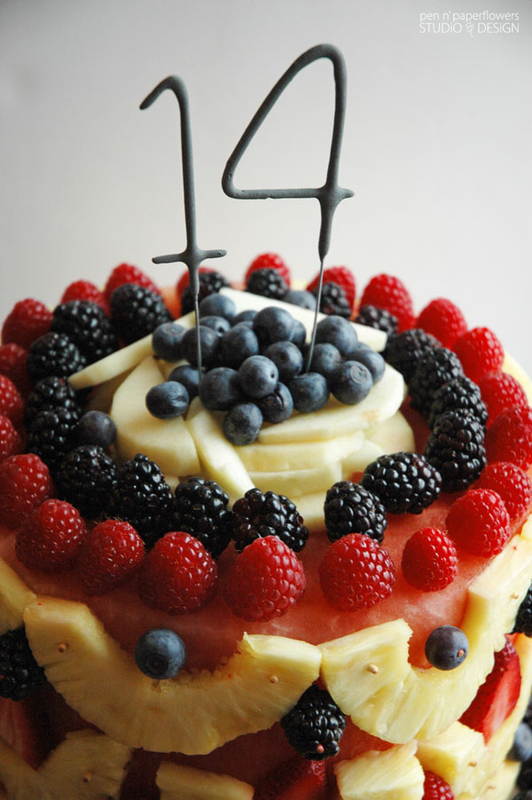 - Don't fret over getting your cake perfectly round. You may have one side a little lopsided. That's okay. 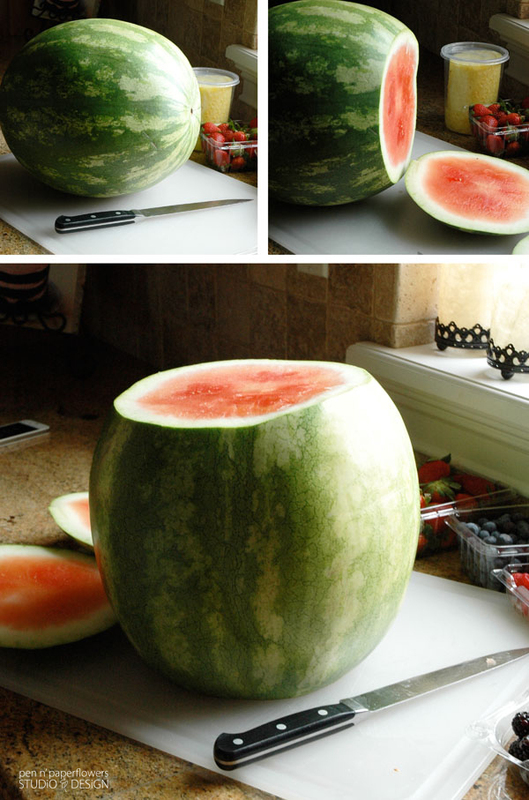 - The smaller the watermelon, the less fruit you'll need - depending on how you decorate it. You'll see it in the photograph of my gathered fruit. Oops! Thanks goodness I remembered before I started adding it to the cake. The idea to nestle some of the berries on the side of the cake in the pineapple slices came to me because I forgot to pick up more toothpicks when I went to the grocery store. This actually worked out MUCH better because there were less toothpicks to have to remove when we sliced and served the pieces. This is brilliant and so pretty! 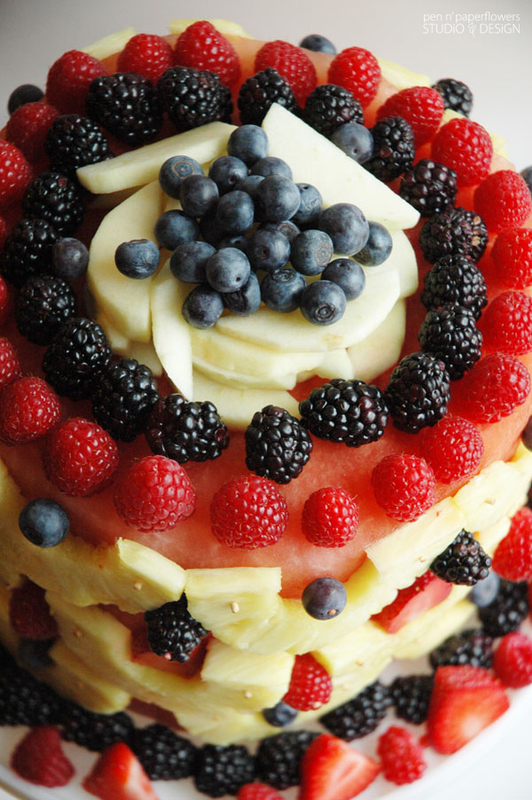 I can see '4th of July picnic' in this yummy creation. Thanks! YUM! That looks so good! That would be a great dessert for Easter! 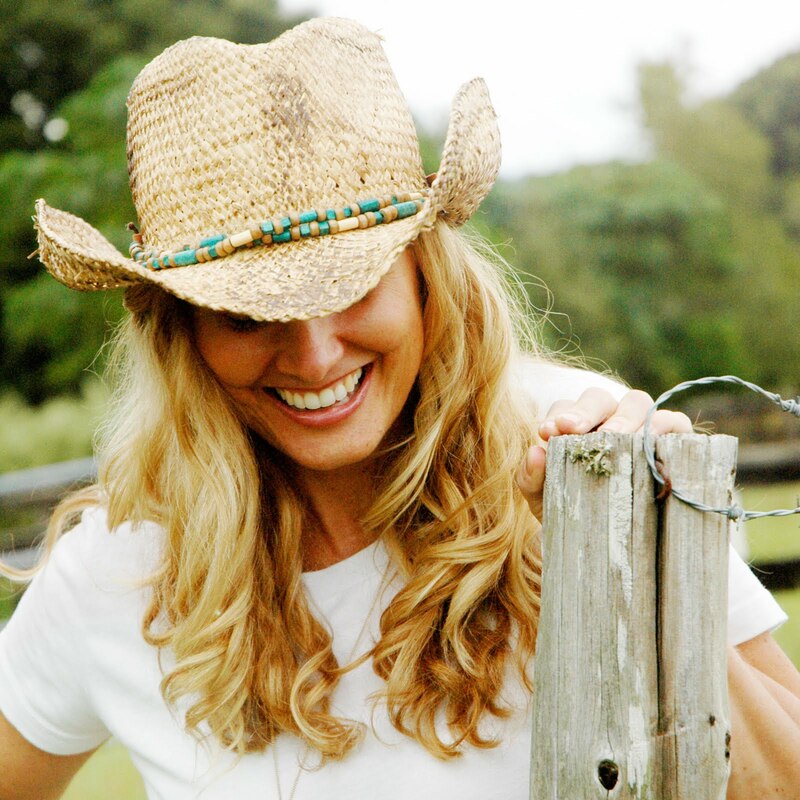 Bellenzo Bistro and kansasgirl1 - I'm so thrilled you both like the "Fruit" Cake. Your suggestions for using it for Easter and for the 4th of July are spot-on!! I hope you'll try it and if you do I hope you'll share how yours turns out!! Hugs to both of you! Absolutely adorable and mouth watering. Creativity at its best. Hi, I hope this post isn't too old to get an answer to a question. 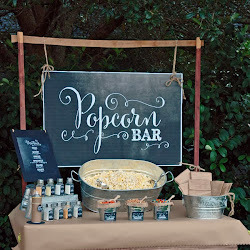 First off, what a great idea and beautifully done! I wanted to make this for my daughter-in-law's birthday. My question is, I'd need to make it the day before and then transport it to the party. Does this leak watermelon and fruit juice all over or is there minimal juice once this is cut and put together? Thank you! Hi there! I'm thrilled that you liked the post. I've made several different versions of this fruit cake since the original post. I have not personally experienced too much fruit juice. However, I typically make mine the same day. I'm not sure if it would be a different experience keeping it overnight in the refrigerator. 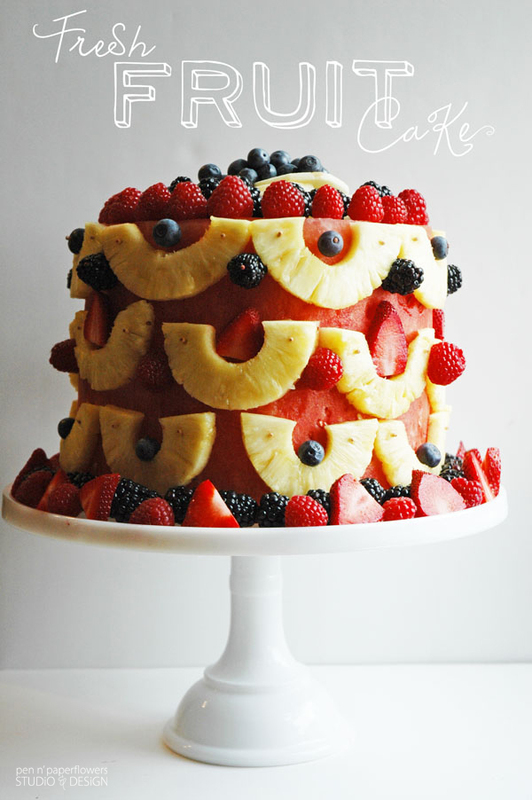 Be sure to search my blog for other fruit cakes so that you can see the different styles I created for additional inspiration. I'm so glad you're going to try to make one of your own! They're a lot of fun! Thank you so much for the reply, Jessica. I've been pondering this a few days and now I'm thinking of cutting everything up the day before, refrigerating it and then putting it together once we get to the party location. I will definitely search your blog for the other cakes. I haven't decided on a set design yet, so more inspiration would be a wonderful help. Thank you again and take care!